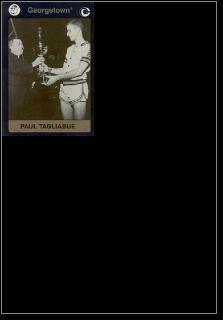 Paul Tagliabue was born November 24, 1940, in Jersey City. He went to a public high school in Jersey City and received an athletic scholarship to play basketball for Georgetown in 1959. Although he suffered a ligament tear during his sophomore season, Paul remained on the team, but focused more on academics. He became captain of the team for his 1961-62 senior season. Paul graduated in 1962 as the president of his senior class. He was a Rhodes Scholar finalist and a Dean's List graduate. Paul then went on to NYU Law School in 1965. In 1969, Paul began working as a lawyer for the National Footbal League. He became one of its lead lawyers in the 1980's. Because of much legal turmoil in the NFL at this time, he became a close adviser to NFL Commissioner Pete Rozelle. In 1989, NFL owners selected Paul to replace Rozelle as Commissioner of the NFL. During his time as Commissioner, Paul expanded the NFL from 28 teams to 32, adding teams in Charlotte, Jacksonville, a new team in Houston after the Oilers departed, and a replacement team in Cleveland after the original Browns moved to Baltimore. Paul also made the decision to cancel all NFL games scheduled for the weekend following the 9-11 terrorist attacks. The games were rescheduled for the end of the season, pushing back the Super Bowl into February for the first time. Paul also took a stand against the State of Arizona, which refused to recognize Martin Luther King, Jr. Day as a holiday. In 1993, the Super Bowl was to be held in Arizona, but Paul moved it to Pasadena because of Arizona's rejection of the holiday. He also firmly believed the Saints should remain in New Orleans after Hurricane Katrina derailed the team in 2005. Paul convinced Saints owner Tom Benson not to move the team to San Antonio. Paul stepped down as Commissioner in 2006, passing on the job to Roger Goodell. In 1992, Paul received the Eagle Award from the United States Sports Academy, the highest international honor. Paul was also selected by Georgetown in 2008 to serve a three-year term on their board of directors. He has received honorary doctorates from both Colgate and Northeastern Universities.